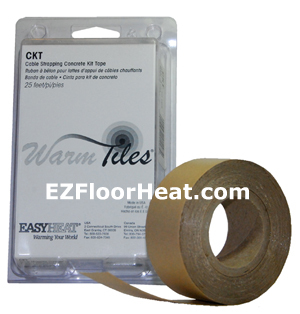 Made specifically for the Warm Tiles Cable Kits, this double faced adhesive tape, when used over a clean, smooth concrete floor or cement board surface, eliminates the need to drill and tap screws into concrete surfaces for the purpose of securing the metal cable strapping to the floor. This tape will not adhere to a dirty or dusty surface. Not suitable for wood sub-floors.